With 7% Glycolic Acid, Amino Acids, Aloe Vera, Ginseng and Tasmanian Pepperberry. Glycolic Acid is an alpha hydroxyl acid that exfoliates the skin. 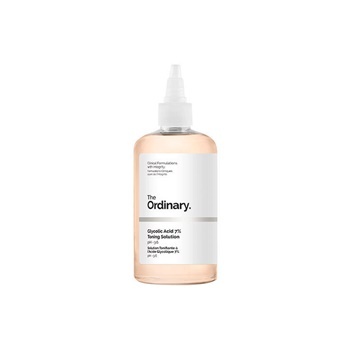 This 7% toning solution offers mild exfoliation for improved skin radiance and visible clarity. The formula also improves the appearance of skin texture with continued use. This formula contains a studied Tasmanian Pepperberry derivative to help reduce irritation associated with acid use. This derivative is of plant origin and varies in colour seasonally and this colour variation may be apparent in the formula from time to time. The formula is further supported with inclusion of ginseng root and aloe vera for both visible radiance and soothing benefits. As someone with sensitive skin, I never thought I would be able to find a daily toner that would be suitable. This product is so gentle and lovely that you wouldn't even know it is exfoliating. Plus it is much more viscous than other toners so doesn't feel too drying on the skin.